A woman died instantly after three more people were struck by lightning in an area of the Ohangwena region which is proving to be lightning-prone. 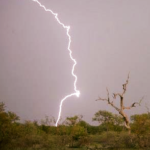 The 38-year-old Yoolokeni Andreas died instantly while two of her shebeen patrons were injured when the trio was struck by lightning in the Etomba village Friday afternoon. According to police spokesperson Abner Kaume Itumba, the two survivors were taken to hospital for treatment but were discharged soon afterwards. The chairman of the Oukwanyama Traditional Authority, senior traditional councillor, who is himself a resident of the Etomba village, said that the deceased had just opened her shebeen and was preparing to attend to her patrons when lightning struck, killing her and injuring the other people. Etomba borders the Oshandi village where the 20-year-old Filippus Josia Nghinamwami was killed by lightning earlier this month.